Brown’s creative culture has long been a place where students have translated their ideas into projects that have real impact on the world. But until fairly recently, there hasn’t been accessible, inclusive spaces where students from across campus could prototype and critique their projects. The Brown Design Workshop emerged from a vision amongst faculty and students to make Brown a place where students interested in design could find the spaces, community, and academic resources to fully actualize their creativity and interest in design. "There was always this question at the end of the semester when I was teaching 'DesignStudio' and 'Strategies for Creative Process',” says Lecturer Ian Gonsher. “What do I do now? How can I study design? My answer was usually a ‘Hmm... maybe go take a class at RISD? Take an art class?’ Get involved with some of the student groups like Better World by Design? There weren’t really satisfactory answers to that [question]." Gonsher had been teaching these classes, nurturing an early culture of design at Brown at Tockwotton Studio, at the invitation of the Visual Art department, but there was a growing need for a space and community on campus where design could thrive. These early experiments with design curriculum led to conversations and the eventual creation of the BDW in early 2013. I just try to encourage students to use this space for different things—I’d like to see it involved with other courses in engineering, see a continuous program through the first two years, see people engaged in this space. I was in industry for a long time and it’s never [as] simple [as a single correct answer]. You’re always making trade-offs and making decisions—if we do this, and this, well… it’ll cost less and you won’t be done or vice versa and [you're] thinking about all the constraints. [...] In design, even if it’s a fairly simple project, you do get this idea that there are a number of solutions, [some] better of those, or the best, but [all] not necessarily perfect. We didn’t have any money, so we had to do it ourselves. We were able to get hand-me-down tables and stuff and I had a little money [from scrap] and I bought some chairs. People gave me a hard time about those chairs. "Why [did] he buy so many chairs?" It’s because I had a vision of what this place might be, and I knew that soon enough, we would have the right number of chairs for the place! Ultimately, the BDW stands to exemplify how Brown students explore design, "not as a method, [but as] a mode of inquiry," says Ian Gonsher. Where we can do things differently, where we have potential to be leaders, is in the creativity of our students and the way they think about problems in the world. The impulse to do good in the world, that design can be an agent for change. If we can tap into that and make that concrete, we have lightning in a bottle. 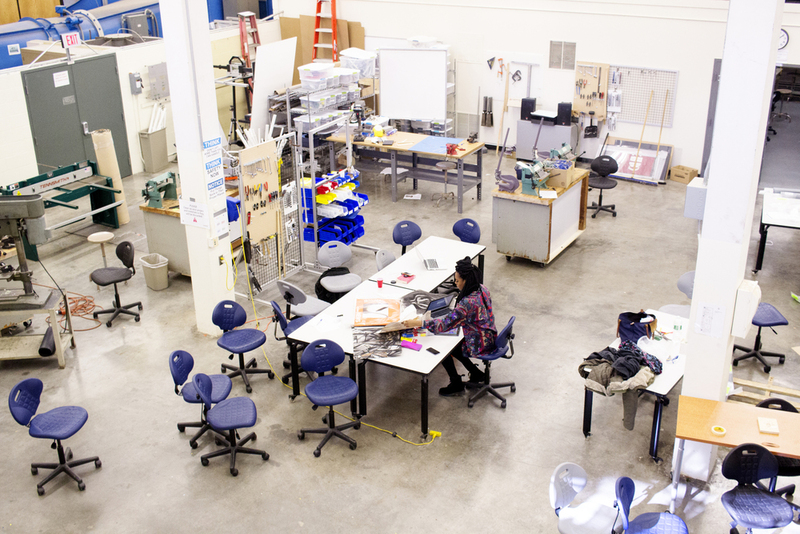 On top of that, we have this resource of RISD, one of the best design schools in the country. Brown students are so amazing and if you give them the opportunity and if you give them the skills and the space and the resources to do things, they will do amazing things. Spring 2013: First conversations about moving some equipment out of Prince Lab begin, to make room for student work space. Instructors (Ian Gonsher, Chris Bull, Clyde Briant, Kenny Breuer, Ed Osborn, Paul Myoda, Michael Littman, former Dean Rob Rome, and others) from multiple ends on campus begin seriously considering a space for project-based learning. Summer 2013: Faculty and staff move old research benches and materials out of PL222. Professor Richard Fishman (VISA) generously allows the laser cutter, then at Tockwotton Studio, to move into Prince Lab. 3D printers were acquired by Professor Kenneth Breuer (ENGN). With the laser cutter and 3D printers, an early digital fabrication space emerges. Fall 2013: Professors Chris Bull and Michael Lye (RISD) use class time with undergraduates to ideate ways to organize the "Prince Lab makerspace" and develop effective furniture for the space. Students in DesignStudio contribute some of the first furnishings and the first cohort of monitors and mangers. A cohort of undergrads starts to form around the space, a community of making-minded people from different ends of college hill. Brown STEAM was early to host public events in the space, with advising and support from Ian Gonsher and Richard Fishman. Spring 2014: The first group of paid monitors from Brown & RISD organizes, to staff the space. At the end of the semester, a showcase of student projects brings new people in. The first managing students—Kelly Hering and Farzanah Ausaluth—graduate. Summer 2014: Bill Patterson helps gets some money towards Instructional Programs that permits purchasing bandsaws. The space is rearranged to accommodate larger flow of people, anticipating ENGN30. The Badge/ID system is established. Fall 2014: ENGN30, the first part of the engineering sequence, makes extensive use of what is now the "Brown Design Workshop" in design/build projects. Monitor hours are established as 7-11pm on weeknights. As needed for ENGN30, the space now has basic wood-working and cold metal-working tools. Workshop curricula are implemented. “Designing Humanity Centered Robots”, a collaborative course with Engineering, Computer Science, and the Humanity Centered Robotics Initiative, encourages students to be both “coders” and “makers”. Spring 2015: Monitor staff is further organized, a group of around 15 undergrads and graduate students. Ian Gonsher teaches DesignStudio in the Brown Design Workshop, the first studio-intensive courses in the space. Barrett Hazeltine teaches Appropriate Technology, making intensive use of the BDW. Many of the founding monitors graduate, and the student leadership team goes through its first major change of hands. Summer 2015: A generous donation, with matching from the university, allows us to repaint, transform 206 from storage to meeting rooms, and more than double our square footage, further into Prince Lab. Summer 2016: The BDW undergoes another renovation with the engineering student groups room relocated into the BDW area and a new BDW tool room is created in 208. Fresh paint also brightens the space with our signature ”safety green” as a prominent color. Fall 2016: We develope a formal system for people and groups to host events in the BDW. We reach out to student groups, conferences, and other makerspaces to grow the maker network. Spring 2017: As the monitor team continues to grow, a formal orientation and training program is developed for new monitors. Workshops are implemented for table saw, shopbot, and several more advanced tools to roll-out to monitors and members.